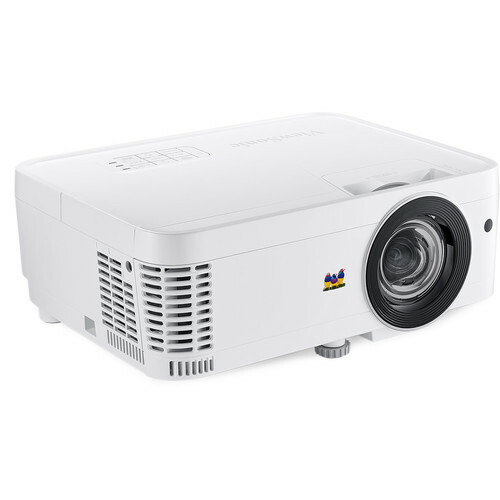 Enjoy bright images in most environments with the ViewSonic PS501X 3500-Lumen XGA Short-Throw DLP Projector. Its 3500 lumens of brightness can overcome ambient light in many situations, making it well-suited for presentation areas such as boardrooms and classrooms. The XGA 1024 x 768 native resolution is suitable for displaying many file and document types, as well as HD video. The projector features a short 0.61:1 throw ratio, allowing you to place it near your projection surface to minimize cast shadows or to facilitate use in small rooms. The PS501X has an HDMI input for connecting digital high-definition sources such as Blu-ray players and HD cable/satellite boxes, two VGA inputs for analog sources, and an RCA composite video input. Its HDMI input is 3D-capable for viewing 3D Blu-ray discs with other compatible equipment, which is available separately. A VGA output allows daisy-chaining of multiple projectors or displays. The PS501X includes a VGA cable and an IR remote control for added convenience. ViewSonic's SuperColor technology features a six-segment color wheel and dynamic lamp control capabilities, helping to provide a wide color range. The short-throw lens enables large images to be projected from short distances, minimizing shadows or hotspots on the image while allowing you to project in small rooms. The PS501X combines 3500 lumens of brightness with a 22,000:1 dynamic contrast ratio to produce clear images in most environments. The dynamic contrast ratio is designed to enhance even the finest shades of gray to deliver enhanced quality and detail for sharp images. Wireless HDMI adapters, such as Google Chromecast, Roku Streaming Stick, Amazon Fire TV Stick, and others, can be plugged into the projector's HDMI port while receiving power via a USB cable plugged into the projector's powered USB output. The USB port can power most wireless adapters, so a separate power source isn't likely needed. The SuperEco energy-saving feature reduces power consumption, extending the lamp life up to 15,000 hours. The PS501X features a low 16 ms input latency to produce fast frame-by-frame action. Enjoy 3D projection with your compatible 3D Blu-ray player and the optional PGD-350 shutter glasses, or any other compatible 3D glasses. When paired with the optional PJ-VTOUCH-10S interactive whiteboard module, this projector can become an interactive projection solution. Multiple users can simultaneously interact and collaborate at the screen by using their fingers or styli. Box Dimensions (LxWxH) 14.0 x 12.0 x 7.5"
PS501X 3500-Lumen XGA Short-Throw DLP Projector is rated 5.0 out of 5 by 1. Rated 5 out of 5 by Vasya from Very bright Very good ..